Google Call forwarding call extensions and call conversions are one of the greatest innovations since the inception of AdWords. Previously the only way for a small business to track calls generated from online advertising was through expensive third party software. With the addition of free call forwarding numbers and call conversion tracking, Google created an opportunity for any small business to access this technology. However, understanding call forwarding call extensions and call conversions can be extremely confusing. There are two different sections where you can find the columns you need. Call details and conversions. Phone call – A completed call through the call forwarding number, which is received (answered) and lasts at least one second. Phone impression – Any impression in which the call forwarding call extension is shown. Phone call conversions – Manually dialed phone call conversions. Mobile click to call call conversions – Are counted as “regular” (actual technical term as per Google) conversions, in your “regular” conversion columns. In call details all I usually add are the phone impressions and phone calls columns. The avg. CPP column is useless (it used to have a purpose), and the PTR column is one you can do without if you have too many columns enabled already. What you primarily want to look for in these columns is – Are you accruing phone impressions, and are you getting any kind of phone call volume (regardless of quality)? Enable your “Phone Call Conversions” columns. Manually dialed phone call conversions are only included in the phone call conversions columns. Also, enable your estimated total conversions columns. This will include all conversions – Mobile and manually dialed calls, plus all writ conversions. If phone call conversions are your only conversion event, then your estimated total conversion columns will show your total phone call conversions. If you also have writ conversions for the account, then you still have some more work to do. You have to either go to the conversions tab, or segment by conversion type at the campaign level to get an accurate count of the total mobile click to call call conversions if you also have writ conversions. Calls From Ads – The Google created “regular” conversion which reports the total mobile click-to-call call conversions. Calls From Ads X (30) – Google recently changed the way you setup your call duration threshold for call conversions. If you have older extensions and you set a duration of 30 seconds to record a completed call as a conversion, you would see “Calls From Ads 30” for those call conversions. Begin by using the Tools > Conversions view to verify that calls from ads conversions are reporting, and that the right call conversion duration is being used. You can also set the cookie duration of the conversion, and check the repeat rate for the conversion in this view. Once you have verified that calls from ads are reporting accurately with the correct settings, then compare the total calls from ads conversions between the Tools > Conversions view and the conversion name segment. As long as they’re accurate, use whichever you prefer. Total call conversions = Total phone call conversions column conversions + Total “calls from ads” conversions. This is where you get all the detailed information. Mobile or manually dialed, area code, duration, received or missed. Received calls – Any calls that answered and lasted for at least one second. Missed calls – Any calls that were not answered. Unfortunately, you don’t have any total columns in the dimensions tab. Because you have no real sorting functionality, the dimensions tab isn’t very useful for account optimization purposes. 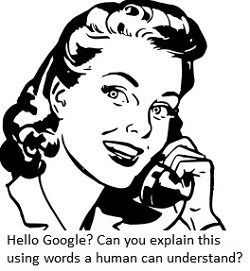 However, you can gain insight as to what kind of calls you are getting from AdWords. There is no reason to have any missed calls! If you are a small business and the advertising is working so well you can’t keep up with the phone – Add another line or two and hire someone to answer the calls. If you see that you are missing calls because they are coming in after your hours of operation, make sure you have an answering machine or service. If you find that the call duration is low, then it becomes a matter of coordinated long term optimization. You can only do so much with the advertising, once you have a potential customer on the phone, you have to close the deal! What can be learned and what changes can be made to increase the phone lead closing ratio? This is the view that confuses people the most. Any data in the ad extensions tab tells you essentially one thing: How many times this ad extension was shown with an ad, and a user clicked somewhere on the ad. Standard call extensions – Use your actual phone number, but are not eligible to track call conversions. Google call forwarding number – Uses a Google toll free number, and allows you to track phone calls as conversions. The primary thing you are looking for in the data is the total number of impressions (Times a phone number was shown with an ad). If you have multiple locations, campaigns, and phone numbers, then you can also assure that the right business line is being used for the proper campaign/location call extension in this view. If your goal is phone calls only and you are a local business, then phone extensions and location extensions (which may include a phone number/call forwarding number) performance should be compared to other extensions overall effectiveness. You want to make sure your sitelinks aren’t getting priority over call extensions, and reducing your potential phone impressions and call volume. There are two segments you really want to look at when it comes to optimizing for phone call conversions: The click type and device segments. Click type segment – The number of clicks on the headline or ad extension, and what type of clicks they are. Mobile clicks-to-call – When a call extension is shown on a mobile device capable of initiating a click-to-call. Manually dialed phone calls – When a call forwarding number call extensions is shown on a desktop/laptop. Mobile phone calls – When a call forwarding call extension is shown on a mobile device. Device type segments – The number of clicks from each device type: Desktops, laptops, or mobile devices. When a call extension is shown on a mobile device, that impression reports in the mobile click to call row, in the impressions column. When a call forwarding call extension is shown, those impressions report in the phone impressions column, and are split between devices. Analyze your total phone impressions per device, in comparison to other click type impressions. Total mobile click to call impressions + Total manually dialed phone impressions = Total call extension impressions. You will likely find that total call extension impressions to be higher than the total phone impressions. A call forwarding number may not be shown with every mobile click-to-call impression. A standard call extension may still be shown if a call forwarding call extension is not eligible, since a mobile click-to-call click does not require a call forwarding number. Another area where many people get confused is that a mobile click-to-call click is just that – a click. Those clicks do not mean that a phone call was completed, or even intended by the user. You need call conversion data to know how many click-to-call clicks are actually quality phone call leads. This is why I no longer use click to call only. If a user clicks on the headline expecting to go to the website, and instead their device initiates a phone call – You are still charged for a mobile click to call click, even if the user does not make an actual call. What’s more, if they want to click through and can’t, then they may abandon you all together. When you segment by device, you don’t get any phone call data, However, you do want to compare your total impressions per device to your total click type call extension impressions to see which devices you may be missing potential calls from. You have to show an ad in high enough of a position to be eligible for any ad extension impression. If your phone impression volume is declining, make sure that you are not losing position on the devices that generate the majority of your call conversions, and that you rank in the best converting positions. When optimizing for call conversions, it’s all about the ad group. Ad group structure, and maintaining ad group volume thresholds to accrue call forwarding impressions is key. The call forwarding number from Google is assigned at the ad group level. Once you lose a call forwarding number at the ad group level, you are not likely to get it back. Furthermore, the call forwarding number associated with that ad group may now be given to another advertiser. Because of this, broader match type ad groups, or larger exact match ad groups may actually be more “highly optimized” for a phone call conversion strategy, over more traditional “tightly themed” ad groups. Your goal is to increase total phone impressions, even if you have to sacrifice some organization at the ad group level. You don’t have the same type of data at every level of the account, so you can’t get the phone impression and phone call data you need to optimize for phone call conversions at the KW and ad level, or in the search term reports. Deciding which keywords are used in the ad group should be more about performance at the ad group level, than the “theme” of the KW terms. Phone call conversions come from search network targeting. Ad group context doesn’t matter in search like it does for display network targeting. Once you have access to all the data, you may find that the ad groups optimized for phone call conversions are very different than ad groups which are structured for writ conversions. Total advertising costs / Total phone calls = Average total cost per call. You can use this approach if you also use analytics events or AdWords conversion code to track click to call clicks as conversions on site. As long as it’s a phone call you can attribute to AdWords as the source, it’s part of the calculation. If you also use writ engagement conversions then the calculation becomes more challenging, since you can’t segment out the costs of a specific conversion from your total “regular” average cost per conversion. In this case we would use estimated total conversions as the primary value metric. Total advertising costs / Total conversion events = Estimated total conversion data. Since you have to piece the call data information together from so many data sets, and the true cost per call depends on how you look at it, we primarily use an all conversions approach for client reporting. We do include total phone calls in the reporting as well, to track and report volume and trends. However, the most honest way to approach the value of AdWords advertising for engagement or lead generation is total costs, per total leads. You can break down each lead, or specific leads by their quantity, but not cost per when you have multiple conversion events. This is actually cheating… kind of. If you are only tracking phone calls as a value metric, and you assume all manually dialed phone calls are free, then you only have to focus on the total calls, and the total mobile cost. This ignores total desktop/laptop advertising costs, but – You do get to “cheat” by including the “free” desktop/laptop phone calls. Total mobile device cost / Total phone calls = Average total cost per call. This is really the only method to use for small business owners that don’t want to use a call forwarding number to get some kind of call reporting data, if used in conjunction with events or conversions for mobile devices on site. Since the only devices capable of initiating a click to call on site are mobile, only mobile costs are associated with those calls. Optimizing for phone calls and phone call conversions requires a different strategy than “traditional best practices”. Since maintaining volume at the ad group level is so important – You may want to reduce the number of campaigns in your account, and the number of ad groups within the campaign(s). Since you can use negatives, call extensions, and sitelink extensions within the ad group, consider only creating a new campaign when you need to make a campaign level settings change. If you expand the KW terms in your ad groups to maintain volume, and find that the ads are now too specific, then try a more generic “call focused” ad. You can’t get as much information as you do when optimizing for writ conversions. This is one of those “facts of life” when it comes to AdWords that you have to accept and come to terms with in your own way. 🙂 You may find that it’s actually helpful to re-think everything you have done for so many years because you don’t have the information you used to use to make your optimization decisions. An ad or KW that looks like it has a terrible conversion rate may be the one generating all your phone call (manually dialed) conversions. The tools aren’t designed to optimize for phone calls. When the ability to track phone calls as conversions rolled out, I had very high hopes for the possibilities. If you can count calls as conversions, then you should be able to use the conversion optimization tools to optimize for phone calls, right? Well, not really… You can optimize for counting converted clicks or conversions in your account settings, but not for estimated total conversions, or phone call conversions. Since Google can’t get engagement and usage data from a user when they are on the phone, whatever part of the conversion optimizer algorithm uses that data breaks down. Don’t switch conversion strategies and expect that the same tools with the same settings will be just as effective. The AdWords landscape is always changing, and I’m sure all this information will be outdated soon. 🙂 Until then, thanks for reading, and if you have a question about AdWords call forwarding extensions and call conversions, or there is something I missed here, please let us know in the comments section.